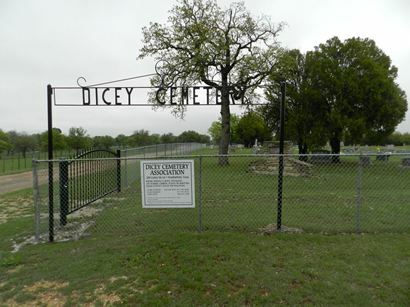 Dicey Texas and Dicey cemetery. Settled in the 1850s, Dicey was named after a woman. The man who was brave enough to marry a woman named Dicey was named W.G. Puryear. 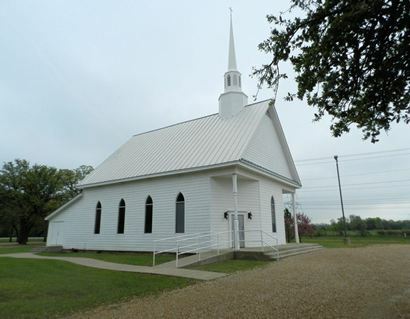 Before Dicey, the community had been named Power after a minister of the local church. The town had a post office from 1891 until it closed in 1929. 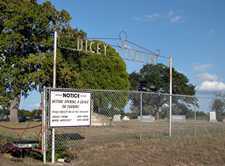 The population of Dicey never exceeded 100 people. It was around 60 from the 1920s until the 40's. After that the population was estimated at somewhere around 20. After noticing on your website that Dicey was located only a handful of miles from our house, I decided to go look for it yesterday, having never heard of it before. Heading south on FM 730 from Azle, Dicey was to the right off North Shore Lake Dr, Lake Weatherford was to the left. From there it's maybe about an eighth of a mile on a dirt road to the right. 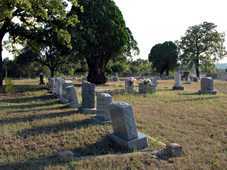 This is where the cemetery is located anyway. About all we could see was the cemetery and a few homes scattered nearby. No sign of what might have been the old post office. 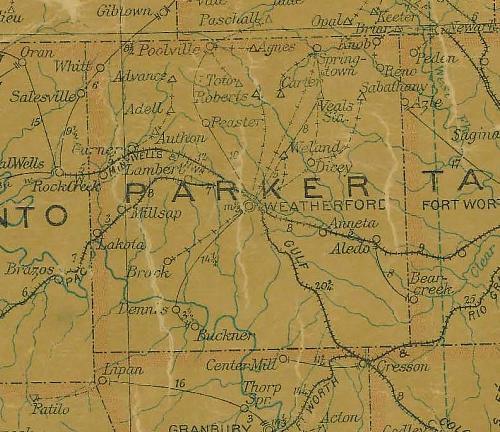 There was a sign saying that the land for the cemetery had been given to Clear Fork Baptist Church by William Baker Family in 1869 but we didn't see the mentioned Church.